Seeing the results of the Google Android Developer Challenge today was like being told what you’re getting for Christmas … in July. Worse yet, what’s under the tree is mostly socks and underwear. Google announced the 50 round-one winners in the worldwide search for the best Android-developed applications. For using Google’s open-source mobile operating system, each winner will receive $25,000 to further fund their apps. 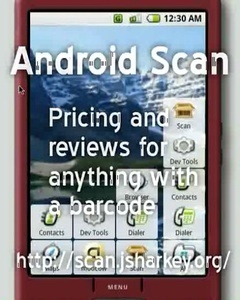 Phandroid, an Android fans blog, which provides some links and descriptions of the winning applications. It’s not that the winners are unworthy and their applications unimaginative and useless. Quite to the contrary. These point to the future of mobile applications. It’s that there are still no Android phones to see these applications in use. For the most part, these apps are one step beyond the engineering breadboards shown by hardware and accessory developers earlier in the year. These programs are prototypes with no place to go other than YouTube. Some winners provided YouTube videos showing how their apps work on a software simulator. Some folks worked up cute animations to demonstrate how their programs will function once Android-powered phones are available for purchase, most likely toward the end of 2008 and into the early part of 2009. At least with the coming iPhone software developer kit (SDK), due next month, developers can begin creating applications for a real phone; those programs will go through a quality control process; and at some point a short while later they will end up for sale in iTunes. Best of all, people will be able to buy the programs they like and install them immediately on iPhones … not software simulators. And not that iPhone developers need to look over their shoulders at Android developers, but with the first round of the Android challenge concluding (and a final round to begin), Apple and its developer community can see what’s being worked on, by whom, what the features are, and then make sure similar applications for the iPhone are better, slicker, cooler, easier to use, desirable, and work in harmony with the hardware. For what it’s worth, the Android developers focused on pretty much what we thought they’d do — location/geography/navigation applications, social networks/friend awareness, shopping, games, the weather/environment, and safety/security. Maybe it was due to the terms of the competition, but it seemed like established software companies looking to add an integrated mobile component to their desktop solutions and/or Web services were no where to be seen.